On Tuesday, the Kent, Washington-based outdoor retailer posted record numbers for 2018 – $2.78 billion in sales, $47.1 million in net income, and $204 million in member dividends and other rewards (up 6 percent, 54 percent and 4 percent, respectively). The company also added more than a million new members, for a total of 18.3 million. “The financial top-line numbers are terrific in comparison to other large retailers and the (outdoor retail) industry,” said Matt Powell, who follows the sector for NPD, a market-research company. Those sentiments were echoed by Eric Artz, REI’s interim president and CEO. “We’re excited about the results that we’ve enjoyed in 2018, and we’re off to a good start in 2019,” Artz said in an interview Tuesday. Admittedly, that “good start” was delayed somewhat as the company grappled with some unwelcome publicity over a major personnel change. On Feb. 12, REI stunned the outdoor world with the news that Jerry Stritzke, the company’s high-profile president and CEO, had resigned after failing to disclose a “personal and consensual relationship” with the head of “another organization in the outdoor industry,” according to a company statement. Artz, who was then REI’s chief operating officer, was appointed as interim CEO. A company investigation found no financial misconduct, but Stritzke’s failure to disclose the relationship “led to a perceived conflict of interest” for the retailer, which has long cultivated an image of ethical business practices and transparency, the company said. Stritzke’s fall came at a delicate moment for REI, or Recreational Equipment Inc., which was founded in 1938 in a corner of a Seattle cooperative grocery. 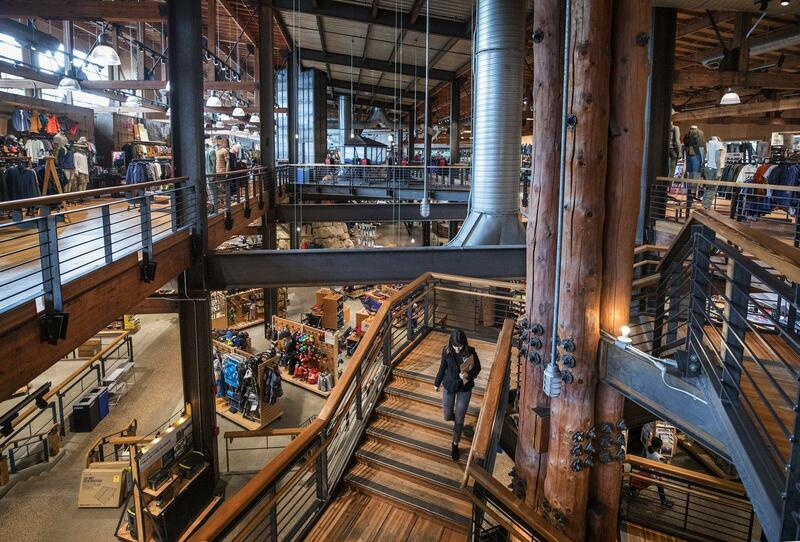 Despite impressive growth – REI opened five new stores in 2018 and plans six more this year, for a total of 160 – that expansion comes in a highly challenging business environment. In recent years, outdoor retail has been pummeled by online retailers and the rising popularity of rental and secondhand products aimed at a younger, cost-conscious consumer – serious threats to a retailer known for selling high-end products in “experiential” showrooms in upscale markets. To maintain its momentum, REI has continued to invest in its brand as a corporate do-gooder: in 2018, the firm gave $8.4 million to various environmental groups and other nonprofits, though that was down slightly from last year’s $8.8 million. But REI’s real investment has been in technologies to stay relevant in an online retail environment. The company is spending heavily on a platform that will let shoppers move easily between the company’s retail locations and its online operation. REI is also upgrading its merchandising systems so it can tailor each store’s inventory to local consumers. “Our store in Santa Barbara is very different than our store in Tyson’s Corner, both in customer needs and the type of activities they’re doing in those areas,” Artz said. Those upgrades haven’t come cheap. REI won’t break out its technology spending, but Artz said it has been “disproportionate” relative to the company’s rate of growth. That heavy spending is one reason the company’s pretax income in 2018 was actually lower than in either 2017 or 2016. Were it not for the federal tax cut that went into effect last year, REI’s net income might well have been lower in 2018 than it was in 2016. Still, Artz said the company was well situated to make such large investments, with $271 million of cash on hand and no debt. REI’s investments have earned plaudits from retail analysts, many of whom regard REI as a test case for an upscale outdoor retailer in a digital-disrupted age. Powell, with NPD, says retailers that want to maintain physical locations can’t do so without “best-in-class e-commerce,” he said. REI also gets kudos for its upscale branding. Although some longtime REI members may mourn the loss of a more traditional co-op aimed at a middle-class customer, analysts like Powell say that in today’s marketplace, outdoor retailers can be either discount or high end. “There is no middle anymore,” he said. Still unsettled, however, is the choice of a successor for Stritzke, who oversaw the retailer’s so-far successful expansion in a digital world. REI officials say a search is underway but declined to discuss a time frame or say whether they had conducted any interviews. Artz, who joined REI in 2012 after serving as chief financial officer for Urban Outfitters, wouldn’t say whether he himself was under consideration for the job – or even interested in it. Published: April 10, 2019, 9:12 a.m. Updated: April 10, 2019, 12:49 p.m.